As a natural hair vlogger that reviews a handful of new products on a regular basis, it is expected that I am bombarded with questions related to my favorite or staple products. Unfortunately, I don't like to play favorites when it comes to my products. It's just so hard to pick "that over this" when it comes to certain brands. So instead, I decided to start a "Battle of the Butters" post that will showcase my favorite butters and my results when wearing 'dos styled with these products. Since I get a ton (literally) of questions related to Original Moxie and Entwine Couture, I'm going to feature them in this post along with my newbie favorite brand for butters, Afroveda. I hope you enjoy and if you like these type of posts let me know in the comment section and I'll be sure to do more! First up: Butters by themselves. As you can see, the Original Moxie's Lux Locks gives me a BOMB twist-out the first and second day of wearing the style, but if I don't re-twist (which I did not do on the third and fourth day, which is normal for me), my twist-outs turn into a big and undefined fro. This is pretty much expected if you don't re-twist with virtually any product, but since I'm a busy gal, I refrain from using products that makes it mandatory to re-twist to still obtain a nice looking twist-out throughout the week. Now look at Entwine's twist-out using their Jelle Styler. I can get away with getting a nice twist-out without having to re-twist it at all! I even picked out my hair after wearing the style for three days and my fro looked light and fluffy (I definitely got a load of compliments when wearing this oldie but goodie style (for-hawk). However, my hair is not as soft as Original Moxie's Lux Locs makes it, but to be completely honest, when I'm on the go, that's the last thing I'm thinking about. Now let's take a look at butters with their "sister" product. This is my favorite combo! 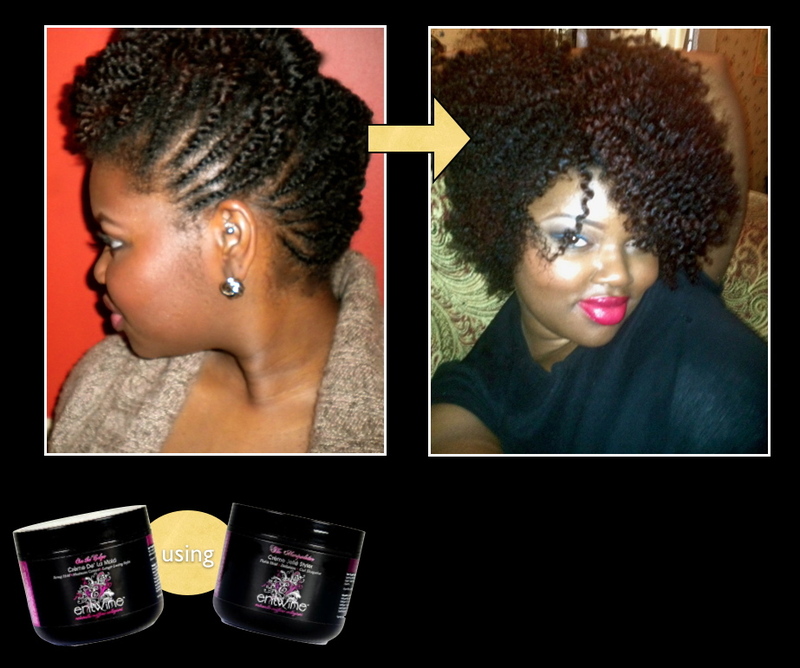 Original Moxie's Lux Locks with Original Moxie's Just Gel. Why do I like it so much? Because I can wear a protective style for five to six days and still get a lovely looking twist-out after taking it down and it still feels as soft as ever! WHAT???!!?! How awesome is that?! I also use it when I'm trying to get an elongated, super defined twist-out when my hair is wet (not completely tho. 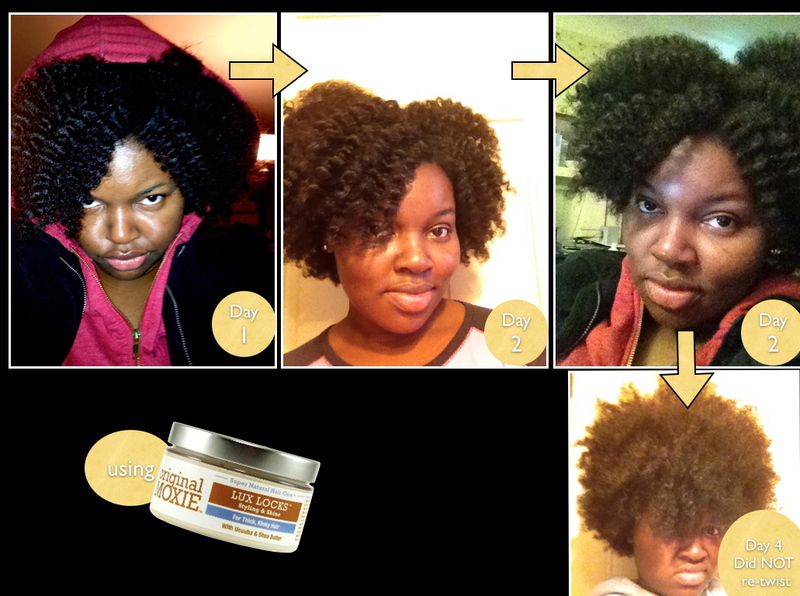 This doesn't cure the "curl disease" that is known as shrinkage lo.l It's not a miracle worker!). 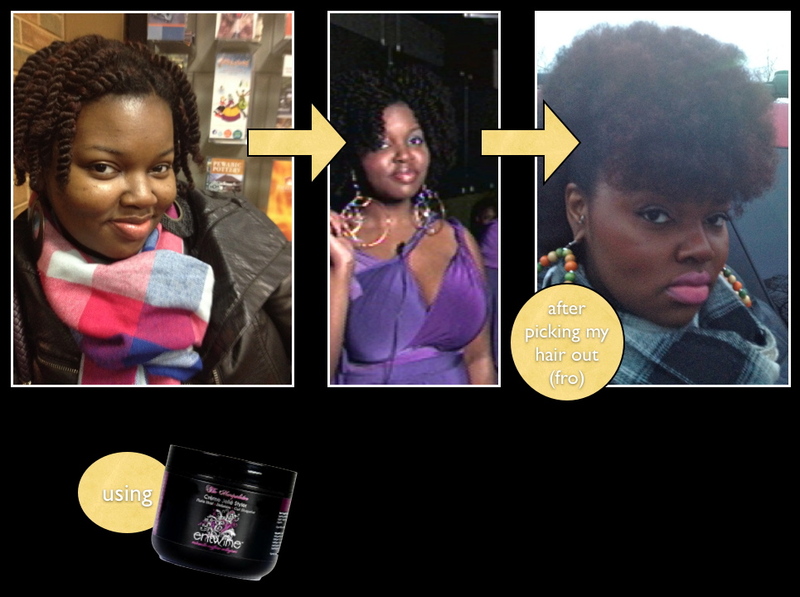 With Entwine's Jelle Styler and Creme De La Mold (which gives hair a "firm hold") it also gives me lovely results. 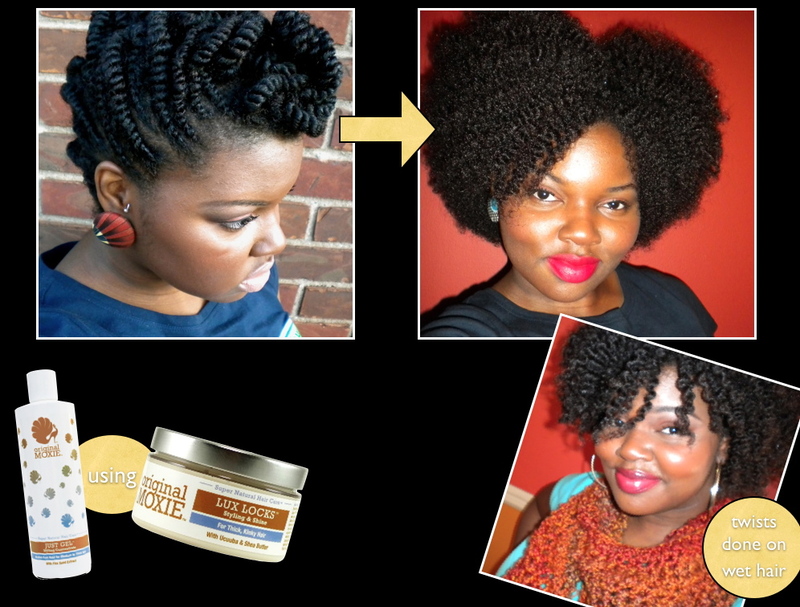 I initially loved the Creme De La Mold specifically for my braid outs, but once I realized it could be used as a substitute for gel, I was even more delighted. 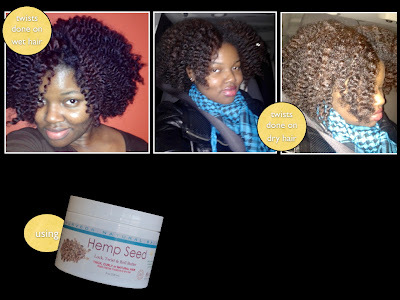 The hold it gives my twist-out is great because it doesn't make them hard and i can steal get a nice looking twist-out when unraveling them. And lastly, I bring you to my newly favorite twist-out product: Afroveda's Hemp Seed Lock, Twist and Roll Butter. I gushed about this product in a video a while back, and have been using it on a regular basis ever since. I love this stuff because I can use it on wet hair and dry hair and STILL never have to re-twist to get a good lookin' 'do. I like to reach for this stuff when Derek comes over because he LOVES to play in my hair and this acts as a "safeguard" product for protection lol. Well hopefully this posts has answered your questions and makes you understand why I refuse to pick just one product when it comes to my favorites! Again, let me know if you would like to see another "Battle of" post and if so, what product or brand should come next? I love this...awesome results! Love the FACE OFF! LOL! Awesome comparison..and yes please do more battle of posts. As well I think the Entwine won hands down..looked more defined and shiny and held up longer better. 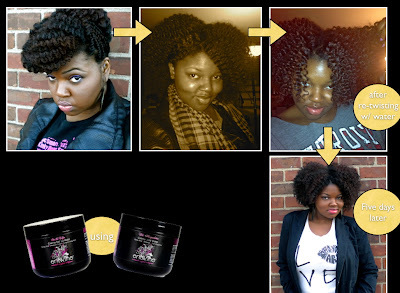 Your twist outs are the bomb.com! Thank you for the comparision. I just ordered some the Entwine products in hopes of getting a better, longer lasting style. Wish i could flat twist like you do! Love, love your twist outs too. CharyJay your facial expressions are priceless! I can't wait to get home to watch some videos so I can try to create a look for tomorrow! Thanks for the info. Do you ever use just regular butters (coconut, mango, shea, etc.)? And where did you get that pretty purple convertible dress? I thoroughly enjoyed this reviews concepts, I especially liked how you showed the results of pairing the product with its "sister" lol. I personally would love to see more post like this! Liked this post alot. With so many products to choose from and alot them being pricey, it's good to see some of the products in action. It helps to narrow down any dilemmas one may be having. Thanks. And yes would love to see more post like this. One of these days I'll be trying those Entwine products! Yes, I loved the post and I think you should continue doing them. Maybe one about shampoos or conditioners. Take Care! Awesome comparison post loved it! Thank you for the comparison blog! Definitely have to try the Entwine products. Even tempted to try Original Moxie now. Keep up the good work! This is very helpful Chary! Thanks a lot! What about comparing the Entwine Exotique Butter Creme to another Butter? The Entwine Exotique Butter Creme was not included in this past Battle of the Butters. Is there anything that gives your hair as much moisture as the Exotique Butter Creme Hydrator? I love what makes your hair shine and look so moist! WOW! The hair styles are ROCKING and the products... Well, let me just say - I am going to pick up my Entwine products from the shop tomorrow! POW! Umm... What is the name of that hot pick lip gear!? OMG It is to DIE for!